With the USSR's launch of the Sputnik I satellite, the Space Race was on. 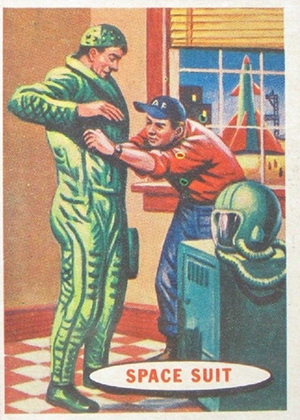 1957 Topps Space Cards chart the launch of human space exploration and look to possible futures of people traveling deeper into the solar system. The 88-card set is filled with colorful illustrations. While clearly Science Fiction, a lot of the ideas were rooted well within the possibilities of what might have been possible. As the checklist progresses, it follows a natural evolution of what space travel might have been like. Following Sputnik, it imagined man heading to the moon, living there and going beyond. Mars, Jupiter, Saturn and even the sun are part of the imaginative set. Card fronts have a detailed cartoon image. Done in full-color, they're vibrant and distinct. They come with a basic white border and a short caption set inside an oval. The blue backs are equally distinct. Set in space, there are several illustrations including planets and stars. A write-up and the Space Cards name are in the center of the card set inside a white circle. 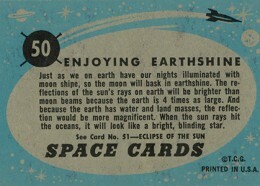 1957 Topps Space Cards are nearly identical to the company's Target: Moon release, which came outa short time later. The two sets have the same basic design. Almost all of the captions are the same as well. The main difference comes with the card backs where the Space Cards title is replaced by Target: Moon. On top of that, Target: Moon cards have a pink variation that was given out as a Popsicle premium. 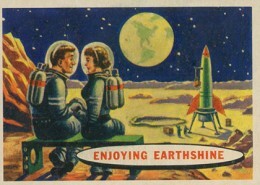 1957 Topps Space Cards remain popular today. With a fantastic design, broad appeal and historical grounding, it remains a cornerstone set from the era. 88 Life on Other Planets? 1957 SPACE CARDS #32 - Rocket Jet Heat - PSA 8 NM Mint - HIGHEST GRADED ! I have three 1957 topps space cards 84,72,70 all in very good shape. I have numbers 1, 7,28,29,56,60,63,69,75,48 and 85 I cannot find value. Some duplicates. From child hood. I would like to complete the collection. Or sell. I might be interested in your cards. If you could provide scans, I’ll take a look and make an offer. I have a full 88 set of Topps Space Cards. These cards are in perfect condition and for sale. Let me know if the set is till available? I have a set of 1-88 all in excellent shape.